We are home. We are all fed and have all slept. Miss Courtney is no longer seizing. That can change at any moment but for now, we have even gotten a few smiles. God is so very good. After my last few posts, my email and other social media blew up with so many of you sending love and oceans and oceans of prayers our way. Know that they were heard loud and clear. Our daughter was surrounded with so much love as were Jerry and I. 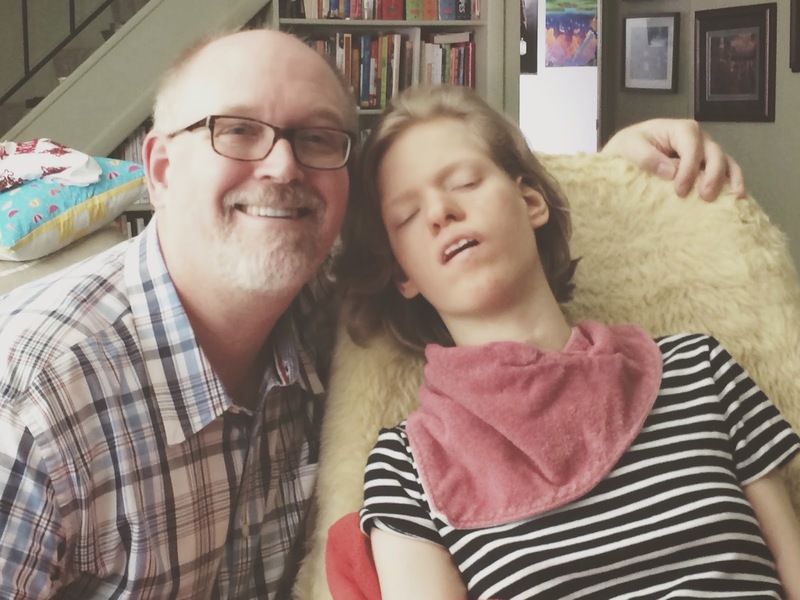 On Sunday morning when Courtney and I were alone in her hospital room waiting for my mother to arrive with Holy Communion, I climbed into her bed with her. I needed to hold my girl after all that had transpired and empty my heart to her. Just the two of us in a dark room. No interruptions by medical staff, no more meds to take, just Mama and her girl. I put my phone on Pandora and pulled up one of my favorite channels, Christian artist Audrey Assad. Music really helps me channel my feeling sometimes, so Miss Courtney and I were going to have a little praise and worship church session. Needless to say, I wept. I wept hard. I even blew my nose in Courtney’s hospital blanket since I knew we were taking her home. My little way of being a rabble rouser. I begged God in my head “Just tell me what to do and I will do it. No matter what.Just tell me.” I was quietly crying holding Courtney and telling her how proud I was of her and how much I loved her. She had taught me so much about love and life. The next song came on to my phone and my breath caught. You don’t think God was with me in that moment, singing to my daughter about His promise to her and to me? Love NEVER fails. That is what He is asking us to do. LOVE her. CARE for her. Let her continue to change us and mold us into the people that God needs us to be. I sang my heart out to her. She snuggled in more and I just cherished every second. I knew that God was talking to me through these words and when the next song started I knew He was talking directly to my daughter. I love Kristene Mueller. I love her voice, her quiet strength and her lyrics are something powerful. I heard the first word and knew the song “Homeward Bound” was coming. Thus song has significant meaning to us since it’s release in 2008. It is a song that will be played at Courtney’s funeral Mass whenever that will be. I cannot type all the words out, just listen to them. Imagine that my Courtney is singing them, because she was my friends, she was. My Courtney smiled!! She freaking smiled and laughed as that song was playing. I mean she smiled and laughed then she had a seizure then smiled and laughed, then had another seizure. It kept going throughout the song. She knew what was being sung, she knew that she would see His face and soon. I just held her and watched in silence. God was granting me a moment to see my child and know that she knows exactly what’s happening and she can’t wait to SEE Him!! She can’t wait to finish this race and be with Him for an eternity. There was no fear in her face, no pain, nothing but joy!! Those buck teeth were out and she was smiling from ear to ear. I just took it all in. I will never forget it as long as I live. My mother arrived with Communion right afterward and Miss Courtney received. She was just so calm and beautiful. I felt God’s presence so strongly in that moment. My heart was so full. No fear, no worry, just love from Him to me. I told my mother what happened and she cried. My mother doesn’t cry y’all. She is one stoic woman but she just kissed Miss Courtney’s hand and told her that we would walk her all the way. She would never be alone or scared. She was loved and prayed for by so many people, that whatever time she had left with us would be filled with joy and not sorrow. What now? The Docs at the hospital suggested it was time for Hospice. We have already been providing palliative care for the last several years, so this would be the next step. I wish it were that simple. Courtney doesn’t have a disease. She has seizures and those seizures have caused all kinds of trouble in the last two decades, and continue to do their damage. It’s not the seizures that hurt her per say. It’s the meds to treat the seizures and the continued brain damage that has occurred over time due to medical intervention or her lack of oxygen over the years that have been the problem. The other issue is we do not have a time frame other than 1-3 years. We learned today that’s not a hospice time frame. They come in at the end, 3-6 months or so. The can’t give us an exact time frame. No one ever has. That’s what makes every single day with her so precious. This doesn’t mean we will be carrying this torch alone. We meet with the g-tube team and dietician tomorrow morning. She will not be able to eat by mouth any more (other than the occasional sweet potato when she has been seizure free for at least a day). It’s not safe. It could lead to aspiration pneumonia. To be safe we will be feeding her exclusively by tube. I thought I would be sad, but I’m not. I just want to do my best for her. So tube feeding it is. We will have a new formulation made to cover her loss of calories for the seizures. I will feel better once I know we are feeding her everything she needs. Thursday is a big one. We meet with her family Doc that morning and this is when we will know what direction to follow. He will look over everything and help us come up with a plan that will work for our girl and our family. Her neurologist team will also be a part of this meeting as well. We will be monitoring her to make sure the new med amounts are doing their job. We may even be adding more meds to her list. We will see. Next will be the meeting with our pastor to make sure we are following everything we should do with our faith tradition. We will also begin making decisions about what will happen once she is with God. Not an easy conversation at all, but one that needs to happen sooner rather than later. We will make plans based on the results of those meetings. After talking with the Pediatric Chair at GUH I do know this. Courtney will not be leaving us this week. What I mean is we may have many weeks, months and maybe even a year ahead of us, or so the good Doc says.Yes, her liver and kidneys are under massive stress and her ammonia levels are once again climbing, but this is not going to be quick. As always we leave room for a miracle. God is the pilot of this plane and He will guide all the decisions that need to be made. He breathed life into her and He alone will decide when she is needed with Him. You all have asked what can you do to help us? Well, there are the concrete things like the PayPal button on the right side of the blog. Some have asked if they can send gift-cards and such…of course. you can do whatever. We humbly accept anything given on behalf of our girl to help with her care. If you need our address, just email me. As you know, Jerry has been extended for two weeks in his job but still does not have new employment. We entrust this process to St. Joseph. He will walk with Jerry throughout this process and whatever the end results we will continue to trust God for His provision. We will also be re-evaluating her equipment needs. Her new wheelchair seat should be here soon and we will need that for transporting her to the Docs as needed. It will also support her for tube feeding. We will also be purchasing a large beanbag for her. This will help with supporting her crooked little back and give her another position to be in during the day. Not sure where we are getting that form yet, but am open to suggestions. And of course always leaving room for a miracle like this one I got on video today. trim.14313213-7257-488C-A922-4115703B35C2 from Mary Lenaburg on Vimeo. Thanks for the update and sharing that beautiful song. You have been on my mind and in my prayers. May you continue to feel the support of many and especially HIs on the road ahead. Thinking of you all often and praying for grace and strength for all of you during this time. Oh, Mary. This is so beautiful. We are praying hard!!! I'm so glad you got to see her smile. She can see Him Mary! I just know it. We will all be right here praying you guys through. I will especially be praying that your days with Courtney will be filled with joy and not sorrow. The love you share for Courney and Christ is a beauty to behold. I, too, believe she is seeing Angels and Jesus! ! ! I thank you so much for taking the time to write the updates. My family will keep you in prayer every night, and me by the hour! Praying hard for your girl and for her doctors to do Gods will. We are praying here in Oregon. I am praying right now. As much as I want her to stay, I'm also jealous that she gets to go. To sit at the foot of the throne and praise the Father on high, as much as she wants, to her heart's delight. Your words over the last bits of time have proved to me that she and Jesus have a very special relationship and He wants her back. I can't wait to see her some day, standing tall and regal, in a white robe of perfection, her hair long and flowing, her crown probably slightly askew. And her smile radiant, knowing He had a plan all along. I'm so glad y'all are home. And I stand with you in agreement for a miracle. Only God knows when he'll come back. And only God nows when each one of us will be called home to be with him again. I'm standing with you for a miracle that for however long Court has left here with YOU and your family, that that time be PEACEFUL for her physically. Whether it be 6 weeks of 50 years. Peaceful. And restorative to her physically. Thank you for continuing to update. I don't comment much, I'm more of a lurker, but your family has been on my mind a lot. I will be praying for His will to be done. Music is so so good, and it warned my heart to read your descriptions on the song selections. God bless. PS, have you seen the brilliant "Epic Patty Cake Song" Elizabeth Dehority posted? A real joy! It will touch your heart. Cor ad for loquitur. Praying for you as someone who has traveled a similar journey. God bless you as you walk on holy ground with sweet Courtney as she waits to see our Lord with such joy. I am honored to share this moment with your family.